Why would I need self storage in Wheaton, IL? There are a variety of reasons why you might need self-storage in Wheaton, IL. How much is a storage unit in Wheaton, IL? The cheapest storage unit in Wheaton, IL is $31.00 per month. What size storage units do you have available in Wheaton, IL? In Wheaton, IL we have sizes that range from 5'x5' to 12'x25' to suit your storage needs. How much is it for a 5'x5' storage unit in Wheaton, IL? The cheapest 5'x5' storage unit in Wheaton, IL is $31.00 per month. Wheaton is a growing suburban city located in Illinois' DuPage County. Just 26 miles from Chicago, the area offers a charming residential community within reach of big-city amenities. You'll find plenty of local amenities throughout Wheaton, including a nationally ranked library, 800 acres of parkland and a thriving downtown district. The city of Wheaton was named for the Wheaton Train Depot, which fueled the regular railroad traffic that brought settlers to the area. Wheaton was incorporated as a village in 1859, with one of the town's original founders, Warren Wheaton, serving as its president. Warren donated land for the Illinois Institute, which would later become Wheaton College, and together with his brother Jesse led a successful campaign to move the DuPage County government seat to Wheaton in 1867. The town grew steadily but slowly until the 1950s, when it experienced a significant boom that nearly tripled its population. Today, growth has mostly leveled off, but revitalization efforts have breathed new life into the downtown areas. People are drawn to Wheaton for many different reasons, including its convenient location, low crime rate, welcoming residential communities and well-ranked school system. You'll be able to easily access everyday needs like grocery stores and gas stations, and parks and recreational facilities are also plentiful throughout the city. Downtown Wheaton offers many eclectic and local businesses to explore and is also host to many of the biggest community events. It's home to one of the narrowest stores in the Chicago metro area, the Little Popcorn Store. This small popcorn and candy shop was constructed in the 1920s, and was previously just a small alleyway between two buildings. There are several other major commercial developments around Wheaton, many of which include big-box retail stores, chain restaurants and popular shops. Most students in Wheaton attend schools in Community Unit School District 200. However, a small portion of the community in the southeastern part of the city falls in Elementary School District 89 and High School District 87, while in the northeastern part of Wheaton, students attend Elementary School District 41 and High School District 87. The city is also home to a number of private schools, including secular, faith-based and Montessori campuses. 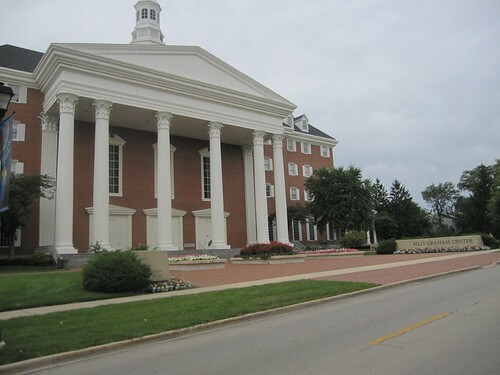 Wheaton College is located near the downtown district and provides both undergraduate and graduate degrees in a variety of liberal arts fields. Utilities: Wheaton's major utilities are sourced from and managed by the city's utilities department, the Wheaton Sanitary District, the DuPage County Public Works Department, Commonwealth Edison and Northern Illinois Gas Co. Garbage and Recycling: Lakeshore Recycling Systems provides curbside collection of trash, recyclables and yard waste. You'll receive trash and recycling cans that are scanned each time your items are collected, determining your monthly payment amount. Transportation: The Pace Bus provides public transit service throughout the city. Parking: No overnight parking is allowed on city streets unless you file a special parking request. Pets: Licenses are not required, but your pet must have up-to-date vaccinations. Water Restrictions: Lawn watering restrictions are generally enforced during the summer months. Home prices in Wheaton are on the rise as demand grows for housing in this desirable suburban community. You can expect to pay considerably more than the national average, and the median home price is also higher than the Illinois state average. However, many of the homes are on spacious, grassy lots and provide lots of space for growing families; you can also consider compact apartments or town houses if you're working with a smaller budget. Our lowest priced units in Wheaton, IL average $31.00 per month. 46 people have reserved units in Wheaton, IL in the past 30 days. There is 1 location within Wheaton, IL's city limits. There is 1 location in Wheaton, IL that offers AC and Heating features.